With an amazing 5200mAh capacity, the Portable Energy Station will recharge your iPad®, iPod®, iPhone®, BlackBerry®, Android®, Kindle®, and hundreds of other devices. Even though it's small enough to fit in a pocket, it still holds enough charge to deliver about half-a-dozen full recharges to a typical smartphone. It uses a patented technology that provides a longer lasting and more stable Li-Po battery. 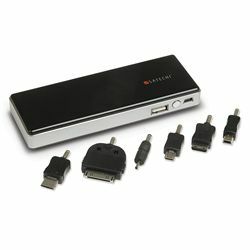 Includes 2 USB charge cables, carrying case, 30-pin connector (for some iOS devices), Mini-USB and Micro-USB tips, and tips for some Samsung, Nokia and HTC devices.